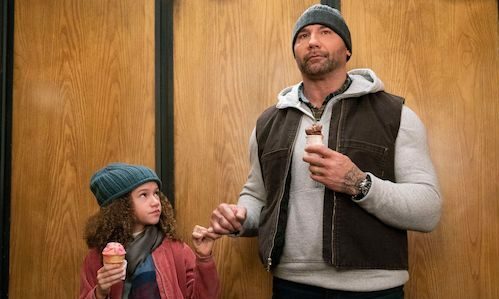 With a speed matched only by Dwayne "The Rock" Johnson, Dave Bautista has gone from WWE superstar (with a match at this week's WrestleMania!) to box office heavyweight. Their paths to stardom have been remarkably similar. While both are great at playing tough guys and powering blockbuster franchises, they had to show their family-friendly side, too. So Johnson had a stopover in The Tooth Fairy, and now Bautista targets the kiddies with My Spy. Bautista plays JJ, a James Bond-esque CIA agent who says he's "not that good with people". Of course, he'll eventually come to be very good with people, or at least one precocious 9-year-old when he's tasked with going undercover and watching over Sophie (Chloe Coleman) and her family. The film is directed by Peter Segal (The Naked Gun 3, Get Smart) with Ken Jeong, Kristen Schaal, and Parisa Fitz-Henley co-starring. My Spy opens later this year.